I'm probably a little unusual among British railway modellers in that I really prefer my tender locomotives to be propelled by a powered tender. The reason for this goes back to my days using German N and HO Scale equipment where tender drives and a free rolling locomotive chassis are the norm. Performance of these models was always superb and, being fitted with traction tyres, haulage powers was often exceptionally good. Of course, tender drives in British models was common with Hornby and Airfix using them but, being of poorer quality they got a bad reputation with British modellers. My experiments in S Scale using re-wheeled and heavily weighted Airfix Royal Scot drive units have confirmed my belief that there are still advantages to this method of propulsion. The first is that there is a consistency in performance which, in model railway operation, is useful. 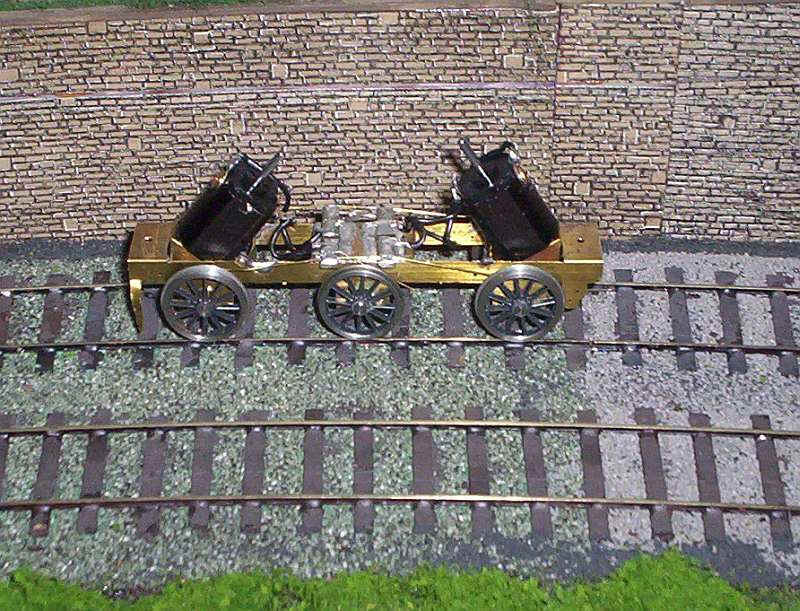 I know that all my Midland locos whether 4-2-2s, 2-4-0s , 4-4-0s or 0-6-0s will all perform in a similar way. More importantly, I feel that the ruggedness of the drive units takes away worries about the strain on our somewhat fragile plastic centred wheels, crankpins and coupling rods. This applies even more so to larger locomotives with Walschaerts valve gear such as the larger LMS locos, which I'm now constructing. I well remember seeing a 4mm scale loco almost rip itself to pieces, when part of the valve gear jammed at high speed and the motor carried on turning. With a free-rolling chassis that's much less likely to happen as the stresses on the chassis, wheels and valve gear are miniscule. A further reason is that the process of actually constructing a locomotive chassis is so much easier if there's no motor to install, and no gearbox to inhibit testing for free rolling. Those irritating problems with valve gear jamming are much easier to solve when you can roll it along the track by hand or simply turn the wheels with a finger to spot a problem. 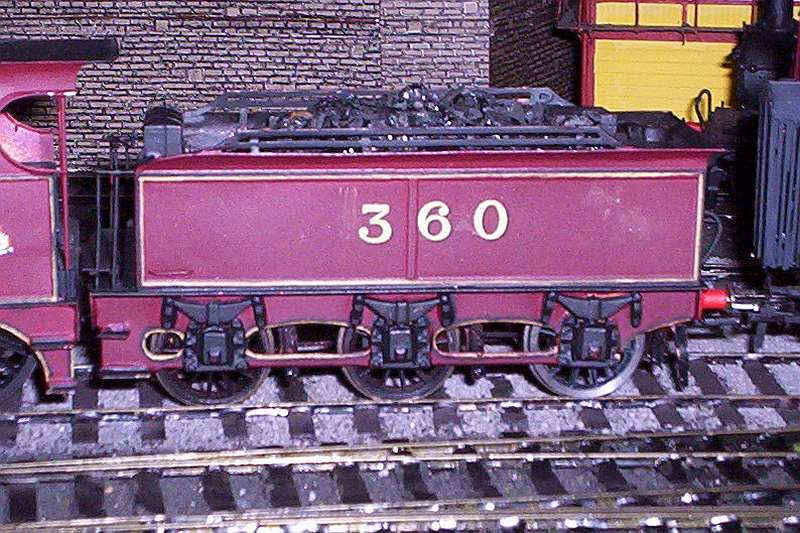 HOWEVER, much as I'm generally pleased with my Airfix conversions, they are no use for tenders with larger wheelbases such as a Stanier 4000 gallon one. There had to be a better way. As I've some Alan Gibson Stanier tender kits I thought it might be possible to adapt the chassis to a powered one and so it has proved. The great thing about this method is that it can be used for virtually any tender chassis of any wheelbase and is equally applicable for both kit and scratch-built tenders. The photo below shows what I did. The kit chassis is a one piece fold up unit which incorporates spaces. I had to remove small portions of the spacers but if you were scratch-building the chassis you'd simply place them in the correct position. The first step is to obtain some motors and gearboxes. I use Mashima 1620s and Comet 1:38 gearboxes. These were assembled and then run in. They are a bit fiddly to build but perseverance results in two smoothly running units. The Comet gearboxes come with worms and gears with grub screws which I much prefer to interference fits and superglue of some others. Obviously, we now need wheels with 1/8" axles and at first this seemed to be a problem given that the Gibson tender wheels have 1/16" axles. However, I opened out the axle holes of six wheels with broaches until the 1/8" axles were a tight fit. Whether this was luck or not, I managed to get three pairs of wheels which rolled concentrically. A more elegant solution would be to use 4mm scale 9F wheels which are virtually the right diameter and, of course, have 1/82 axle holes. The crankpin holes and slightly larger number of spokes would be almost invisible behind the tender frames. The wheels roll in bearings soldered in the frames, with the centre one slightly elongated vertically to allow movement. The rest of the construction involved fitting tender pickups; a couple of printed circuit board strips glued onto the centre spacer and some nickel silver pick-up wires bearing down on the treads of the wheels were soldered in place. Since the photo was taken I've added them to the free rolling centre axle. The motors were connected to the pickups remembering that the polarities of the motors will be diagonally opposite each other so the wheels turn in the same direction! At first, running was a bit rough but after oiling, and the application of some toothpaste(!) to the gears, running has become quiet and very smooth. Of course, one of the advantages of this type of drive unit over the Airfix version is that the entire chassis can be removed from the tender body by un-bolting it. There is no longer any need to have a removable coal load to access the fixing screws. 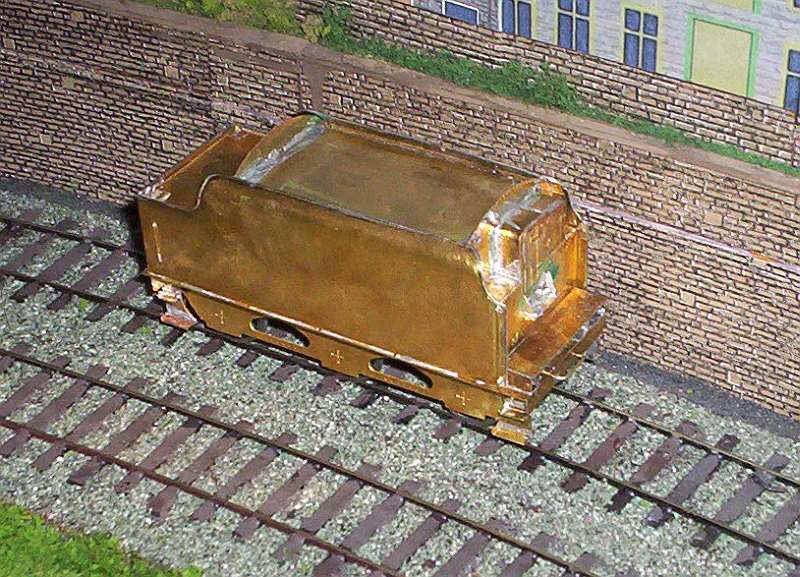 Below is a photo of the basic Stanier tender body mounted on the chassis. What the photo doesn't show is that the body is heavily weighted with sheet lead, so that the tender will pull at least nine coaches and propel a loco. The only slight compromise is that the coal space is flat to accommodate the motor shafts which stick up in the air. However, on future tenders I would arrange matters so that the motors are mounted at a less acute angle. In fact, I suspect that it would be possible to have the motor shafts mounted almost level, provided the end chassis spacers were adjusted to a length that allowed this. I've been so pleased with the outcome of this test that I'm even considering replacing the Airfix drives on my Midland locos with these more smooth running units. All the tender locomotives I've built so far for Halifax have been powered by modified Airfix "Royal Scot" tender drive units. Whilst I've generally been happy with their performance the improvement noted with the Stanier tender led me to wonder if the same principles could be applied to the smaller Johnson, Deeley and Fowler tenders. 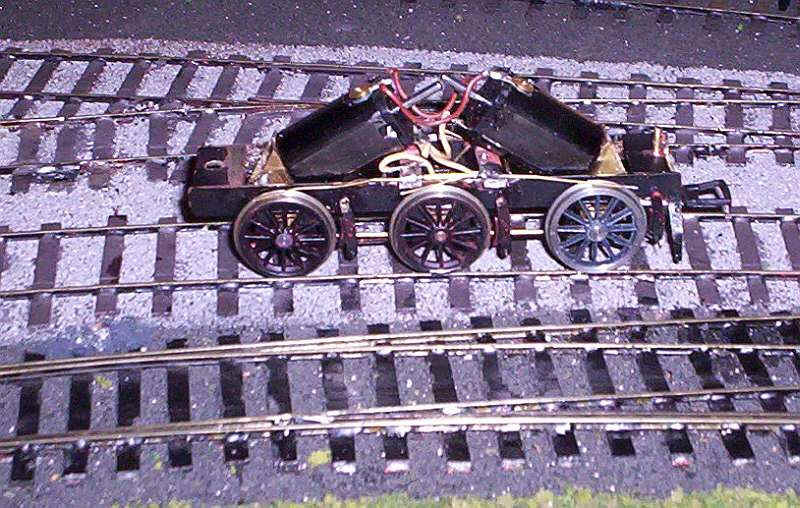 I had a completed Gibson tender chassis so I decided to modify it to a powered version. It had been built with 1/16" horn blocks, so I replaced these with 1/8" ones and fitted Mashima 1624s and Comet 1:38 gearboxes. I have to say that these gearboxes are pretty awful, in that the fixing holes for the motor screws are in completely the wrong place and the large centre hole to accept the armature is also far too small. The result is a lot of unnecessary work drilling and reaming holes. How can firms sell such products, which are clearly "not fit for purpose"? Anyway the photo below shows the completed unit with pickup mounts from copper clad paxolin strip and contact wires on the two outer axles. The centre axle is the original 1/16" axle with the horn blocks free to move up and down. The rear coupling is mounted on a block of plasticard glued to a strip of brass soldered onto the rear of the frames. The new drive unit improves the appearance of the tender viewed from the side. The chassis can be fitted to the body using the original two bolt holes drilled in the tender body floor. I have retained the original removable coal load and weighted the tender as much as possible using lead sheet. Performance is almost as good as the Stanier tender, which is obviously heavier, and is noticeably smoother than the Airfix tender drives. I suspect I will gradually rebuild most of the tenders over time.